THIS SITE IS DEDICATED TO UNCOVERING THE MOST TABOO, UNUSUAL, CONTROVERSIAL AND UNBELIEVABLE STORIES ON THE INTERNET. THESE ARE REAL STORIES BY REAL PEOPLE. MANY ARE TRUE; OTHERS ARE FOR THE READER TO DECIDE. EITHER WAY, IF YOU OPEN YOUR MIND AND FORGET WHAT YOU THINK YOU KNOW ABOUT THE WORLD FOR A MOMENT, YOU WILL TRULY FEEL DIFFERENT ABOUT LIFE ON EARTH AFTER PONDERING THROUGH THIS SITE. ENJOY THE ADVENTURE WHILE YOU OPEN AND ATTAIN YOUR ATTAINABLE MIND. Williams Aerial Systems Platform W.A.S.P. Color photo's of the Moon. 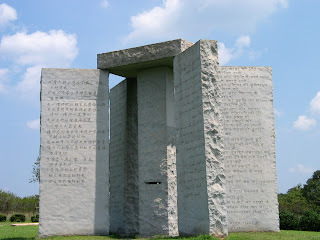 Stephen Hawking's says "Don't Talk To Aliens"
The Georgia Guide stones is a huge monument erected in 1980 located 7.8 miles south of Hartwell Georgia. Some call it the modern day Stone Hinge of the US because of the holes and slots cut out of the rock that align with the sun at particular times such as the winter and summer solstice. It consists of four upright stones 6 feet 6 inches wide, 16 feet 4 inches tall and 1 foot 7 inches thick weighing about 42,437 pounds each. A center stone with the same height and 1 foot 7 inches square with a cap stone on top of all the stones at 9 feet by 6 feet and 1 foot 7 inches thick. There are also base stones that are 4 feet by 2 feet with the same thickness. The stones are aligned in the directions of east and west in order to align the solstices like a big X. You might by saying to yourself, I've never heard of the Georgia Guide Stones, there not in any travel guides. The people who built it wish to remain anonymous. They claim to be a small group of loyal Americans. What's so special about these stones is the massage that's written in English, Spanish, Swahili, Hindi, Hebrew, Arabic, ancient Chinese, and Russian. "Let these be Guidestones to an age of reason." The explanatory tablet says there is a time capsule buried six feet underneath it. It says it's "to be opened on" but give no date. This monument makes sense and I like the message that it brings, but that would also mean depopulation of the earth by about 92%, scary thought. Well, either way it's there for all to see. I think the most important question here is, who are the founders and who are they affiliated with? It's been there for a long time and very few people know about it. Whats the point if your not going to tell anybody. Strange indeed. In 2000 I was living in Playa Hermosa Costa Rica as a surf tour guide and DJ. One weekend I was at a small coastal town called Monazuma in the Nicoya peninsula with some friends. We went out to the bars and had a fairly wild night. The place we were staying was in a little beach house about a thirty minute walk from the center of town. By the time the four of us got back, you could just start to see the light coming from the the morning horizon. We all sat on a log on the beach looking at the sky reminiscing about the night. That's when we saw a bright star slowly move across the sky. We all saw it and looked at each other in wonder. It was easily the brightest thing in the sky. It continued to move across the sky as we all sat and watched with our mouths wide open in awe in dead silence. All of a sudden it stopped, that's when we all kind of started to freak out, not for our safety because it was far away, but because it was at that moment we all realized this was something that could not be explained. I have never had bigger goose bumps in my life. It stop as we looked on, just then it started to get brighter and brighter and brighter and brighter and just as we all started to shout profanity's it was gone. Adrenalin was pumping through us all, "Dude what the f#%k was that?" We knew all of our lives in a way would be different after this experience. We knew what we saw was real because we all saw the same thing. We all for the first and only time had seen only what was talked about in science fiction, we all from this moment on, had been witnesses to a real UFO. I've lived in Virgina, Massachusetts, Vermont, Connecticut, Texas, Colorado, New Mexico, California, Hawaii, Costa Rica and currently reside in Utah. I have had extensive travels throughout the United States, Mexico, Costa Rica, Holland, Switzerland, Germany, France, Italy, and England. I have always been able to get along with people from all walks of life from all around the world and this has led to me meeting some amazing people and hearing some unbelievable stories. As we have come into this era of social interaction through the internet, information that was told through word of mouth now can become a story that's shared by the entire planet. Because of the many things I have seen and heard, and how they have correlated to many stories I have found over the internet, it's this correlation that has led to the inspiration of Attainablemind. By no means do I make any claims of being a professional writer. I'm sure your going to find some grammatical errors. If you find any, feel free to let me know and it's very appreciated. I also ask for you to realize that just because a story has a few grammatical errors, doesn't mean it isn't true. Try keep an open mind while you read through this site and know that the information is to give people a broader perspective of the world and life as we know it. Do your best to not let these errors get in the way of the messages that these stories bring. Errors come from my lack of writing experience, not the origin of the story. I truly hope you enjoy what you find here and I hope for some of you, this has been a real wake-up call to what's really happening in the universe. After the discoveries I've made, I honestly can say I know the true meaning of my life, which is to help humanity by broadening their awareness of this planet through multimedia projects such as this website. Earth can be a better place for everybody, but it's up to every single one of us to make that happen. Once you have made that decision for yourself, you will find that your world becomes the better place you have made it. It's all perspective. If your Royalty, your on top of the world. Compared to if your homeless and hungry in a 3rd world country (like millions of people) life doesn't get much harder. Then ask yourself, where do you fit into the grand scale of things? This is the first step to a better understanding of the world around you. The 2nd step is to stay away from conventional thinking and read the stories I have posted before you. Enjoy the ride as you attain your Attainablemind.